MACH 2018 was a huge success for SCHUNK Intec Ltd with the company announcing that lead generation was significantly higher than the 2016 event. With a stand more than 20% larger than in 2016, the gripping systems and clamping technology specialist received a high level of interest in a complete range of product lines. 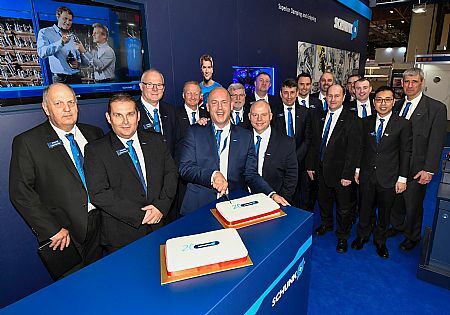 SCHUNK used MACH as an opportunity to hold a special ceremony on its Stand to celebrate the company’s 20th anniversary in the UK. 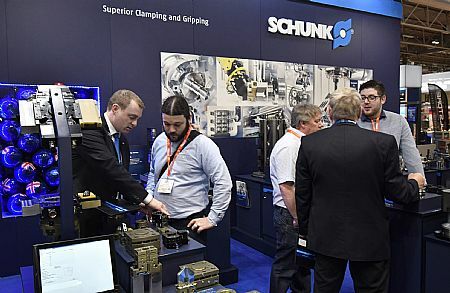 Since entering the UK and Irish market 20 years ago SCHUNK Intec Ltd, has earned a reputation as a technology leader and innovator; gaining market recognition, continuous growth and adding value to the manufacturing industry through its revolutionary products and services. At MACH, established product lines won plaudits and generated a high level of enquiries; however, it was new technology like the new VERO-S Aviation stationary clamping system that really sparked the interest of MACH visitors. Making its MACH debut, the VERO-S Aviation stationary clamping system is a pneumatically actuated zero-point clamping system developed for the direct clamping of structural components in the aerospace industry. Also making its MACH debut and exciting the crowds was the new Co-act (collaborative actuator). As part of SCHUNK’s gripping system program for safe human-robot collaboration; the world's first intelligent gripping module for human/robot collaboration was certainly a central focal point at MACH. The new Co-act permits adjustments to the gripping process to be made in real-time using diverse sensor systems. A standout solution on the SCHUNK stand at MACH was the ‘pick and place’ unit that demonstrated the company’s competence leadership in the field of automation. 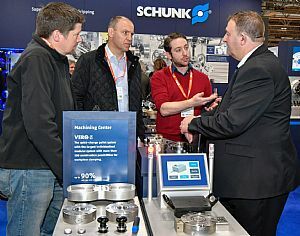 Highlighting how SCHUNK is a leading automation solution provider, the enclosed automation system certainly drew the attention of stand visitors. Alongside these leading systems at MACH was the VERO-S Quick-Change Pallet System, the TENDO Hydraulic Toolholder, the PGN-plus Gripper, MAGNOS Magnetic Clamping Technology, the ROTA-S Manual Lathe Chuck and more. This large selection of premium products from SCHUNK for equipping your robots and machines will deliver higher efficiency and productivity. If you didn’t get an opportunity to visit MACH, please contact SCHUNK Intec Ltd. for more information on our industry-leading product lines and automation solutions.